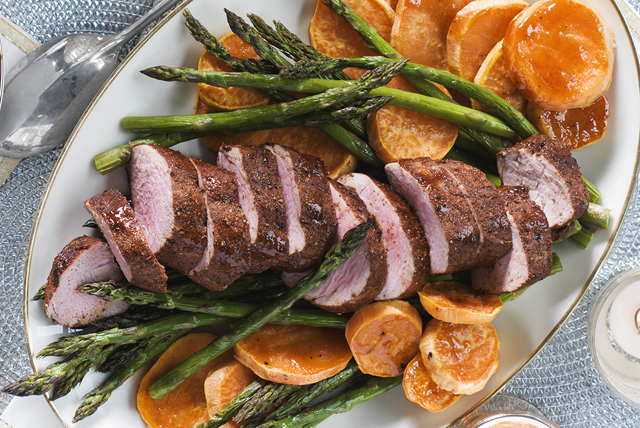 This Glazed Pork Tenderloin with Roasted Vegetables entrée features a delicious glaze made with KRAFT Balsamic Vinaigrette Dressing and a little brown sugar. The pork, sweet potatoes and asparagus are all roasted in the oven at the same time making this a fix-and-forget dinner. Place meat on parchment-covered rimmed baking sheet. Combine seasonings; rub onto meat. Spread vegetables onto second parchment-covered baking sheet; spray with cooking spray. Bake meat and vegetables 30 to 35 min. or until meat is done (160ºF), brushing meat and vegetables with combined dressing and sugar for the last 15 min. Substitute fresh green beans for the asparagus. Serve with a side of hot cooked rice.